Our Aquarium educators come to YOU, bringing sharks, sea stars, anemones and other California marine inhabitants in this dynamic mobile tidepool exhibit. Great for festivals, fairs, and school events! Touch a sticky sea anemone, feel a spiny sea star, and discover the rough textured skin of a shark. 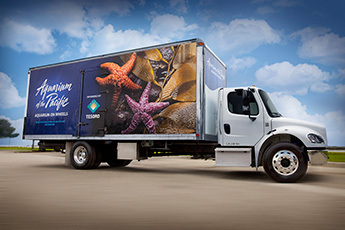 The Aquarium on Wheels brings a local tidepool habitat to venues around Southern California. In addition, our Aquarium educators can lead an exploration of the Pacific Ocean through interactive auditorium and classroom programs for your PreK-12th grade students. Follow the links below for more information. This educator-led experience allows guests to touch and observe animals in our mobile touch pool. A Tidepool Animal Exploration can serve up to 100 students per hour. Great for large school groups, festivals, fairs, and parties. Aquarium on Wheels auditorium programs can serve up to 150 students per program in an assembly style format. All programs include tidepool animal exploration time. Aquarium on Wheels classroom programs serve up to 50 students per program. All programs include tidepool animal exploration. Celebrate a birthday with sea stars, anemones, and sharks! Crafts and games available. I booked Aquarium on Wheels… now what happens? Once you have made your reservation, complete the appropriate pre-visit form to help us plan the specific details of your Aquarium on Wheels visit. These are our most frequently asked questions . Please complete your pre-visit form after you have made your reservation. So what’s it like inside our mobile tide pool? Check out these videos courtesy of KTLA Morning News. Aquarium on Wheels is a unique program, in which we utilize live aquatic animals. In the event that the welfare of those animals is compromised, the Aquarium of the Pacific reserves the right to modify or even cancel a program. We will do everything in our power to keep your scheduled appointment with Aquarium on Wheels; however, if a situation does arise, be it a travel or animal issue, you will be notified as soon as possible and alternate arrangements will be made at that time.